This post is mostly for techs or people with advanced knowledge, situation is as follows. Fritzbox 1 - Had issues with this rebooting constantly, it was sent in for testing and failed during their testing and never turned back on. Fritzbox 2 - Ok for the first week (this was 6 months ago), then had issues with it rebooting, and another issue with the phone line staying connected for around 6-8 hours then going to no dial-tone at all. It crapped itself last week when it was rebooting 13 times a day so we sent it in for a test. Fritzbox 3 (Temporary replacement) - We have this while they were testing number 2 and it has rebooted a couple of times, although not as often as number 2 was happening. Can't tell if issue with phoneline is gone because phone number hasn't been setup on it. Snaps diagnostics = They found no fault with Fritzbox 2 and also there's nothing they can pickup with the line (extended line tests multiple times) at my house aside from some errors which the fritzbox's are automatically correcting. Suggestions were to change the power socket (already tried, also I don't see how this would be effecting it since we have other things like (servers/wireless router/etc) attached without any issues and to maybe get a sparky to come look at the wiring in the house. I'm not here to complain, just to see if anyone can think of anything else that may be causing the fritzbox itself to reboot (this is confirmed by the logs getting cleared). Only thing I can really think of that'd cause three different devices to reboot constantly is power issues. When they replaced the Fritzboxes, did they replace the power brick too (in case it's stuffed)? Otherwise perhaps your house has some voltage variations which the Fritzbox is particularly sensitive to? An old flat of mine had this, caused the Wireless AP to keep dropping out and killed a monitor PSU but everything else seemed to just deal with it. Yeah I was thinking along the same lines as you, but I would think other devices would cut out too because of flaky power supply. Also to answer your question, yes they gave me a different brick. What would you suggest to test the power in my house? SilverwolfNZ: Yeah I was thinking along the same lines as you, but I would think other devices would cut out too because of flaky power supply. Also to answer your question, yes they gave me a different brick. Can really come down to the quality of the PSU. A high-quality computer PSU for example can usually tolerate a complete loss of power for a second or so and keep rolling, while an el cheapo chinese power brick that comes with a $30 Wireless AP will likely have no tolerance at all. Technically you can test it yourself with a decent quality multimeter, but I'd probably err on the side of caution and find a sparky friend you can buy a box of beer for. They'll have quality gear (so you're not questioning whether it's actually the multimeter rather than your house) and hopefully know how to not zap themselves. Just a thought... I recall someone commenting a few days ago that the switch connected to their Fritz was giving them grief with VDSL error rates. What's the ethernet port on yours connected to and can you swap it out for something else to test? I'll look into testing it myself as I've used a multimeter quite a number of times, I just have a feeling that there's only bad readings throughout certain times of the day, maybe depending on something outside of the house. Other than that I don't know any sparkies myself. Kraven: Just a thought... 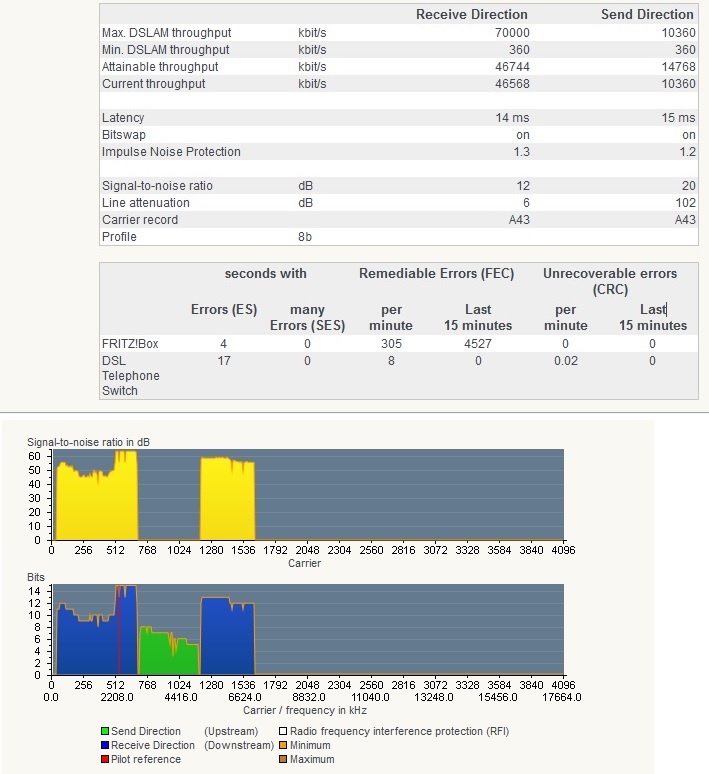 I recall someone commenting a few days ago that the switch connected to their Fritz was giving them grief with VDSL error rates. What's the ethernet port on yours connected to and can you swap it out for something else to test? The switch is going directly into port 2, we have tried both ports independently. The fellow at snap said that even the test modem there had the same amount of errors and its considered withing acceptable range. I was referring to your restarting issues, it's a long shot but it might pay to rule out anything plugged into the ethernet port on the Fritz also. Sorry, I should have been clearer. Got exactly same issue with my Fritzbox restarting. Was fine for first few weeks then got worse and worse at restarting itself. Took it into Snap and after 2 days of testing said was faulty power supply, so gave me new power supply. Now same thing has started happening again, fine for about a week and now its restarting itself again. Power brick is actually making a high pitch wine as well. What ive done is used another power brick of my WDTV as fits on the Fritzbox and so far no issues. But will continue to test for a few more weeks to make sure. My guess is they have some faulty bricks in stock. Will take mine back in sometime but cant be without it internet for next week. EDIT: 5 min after writing this dam thing restarted itself, so cant be power brick. Its super strange as have TV and other devices in same power outlet and they are fine. Also brand new house so highly doubt my issue is with power coming into house. I did notice this time the black Huawei box also restarted itself and its plugged into different power point, could this be causing the issue? I've had similar restart issues with devices where heat was an issue, even though the device was not in direct sun. In an airconned office for testing.... no problems. In an open cupboard at home..... reboots in summer, no issues during cooler months. The irony of this situation is since we've had the test modem its been a hell of a lot more stable. Presently its been up since the 29th and that's a miracle, it has restarted like previously but not the same extent. Does anyone know, will Snap configure a non Fritzbox device to test this problem if I brought say a modem from Telecom. Snap have been good enough to give us a second Fritzbox, but still got issues with it. Firstly on this box the phone would not work at all when I took it home, so called help desk and ended up having to do a factory reset on it. Now it works but tech seemed to have no idea why it was not working originally. This was yesterday and since then had two more disconnects and getting (PPPoE error:Timeout). Is so frustrating and at the stage of maybe buying a different modem to see what happens with that. But would need Snap to set it up I guess, would they do this? Otherwise might consider going back to ADSL, was fine for most things I did and much more reliable. But would rather not have to. The whole thing is driving me crazy!!!! I feel like I have tried everything and have had no internet for 5 days over last two weeks with getting boxes tested etc and still no real answers and no one at Snap seems to know either. Generally love Snap as a company and have for last several years ive been with them, but but this is getting silly now. Sorry for rant but need to vent. Feel like ive taken a step backwards since going to fiber (except for speeds). i also had a period of my fritz rebooting, this was while i was trying a beta firmware that snap got me onto. never had my fritz reboot to heat, and mine gets pretty warm in the day time, to the point where i move it around the table to make sure it doesnt get to hot and do anything..